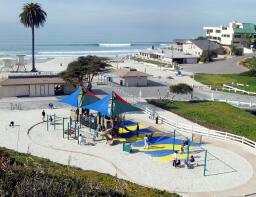 Comments: You'll find this playground where Encinitas Boulevard meets the Ocean at Moonlight State Beach. Can be crowded as it just opened January 2004. Picture provided courtesy of the North County Times. To read the article about this playground by the North County Times, click on the link above. Play Equipment: 2 swings for older kids 2 swings for toddlers. 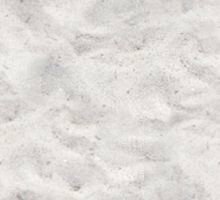 Soft 'squishy' floor and sand mix. Large modern structure with a nautical theme. Canopy above main structure. One side tall with 2 slides, other side short with bridge connecting. Climbing wall to the high area. Several unattached climbing and sand-fun structures. Too many fun features to mention. Steps to the bathroom facilities and snack-bar in the summer. Shade: Yes, and shade pavilions--some over the play area!